The fabulous Emma from Mab is Mab is our writer today. She's a pretty impressive character with skills ranging from the absurd to the down right brilliant - the most absurd is that she likes to cycle... a lot (of course this also makes her all healthy and stuff too), other skills worth mentioning are her awesome photography skills, writing and shopping skills, she's also a voracious reader, graphic designer and book-blogger extraordinaire; so all in all, her review could be nothing but fabulous. 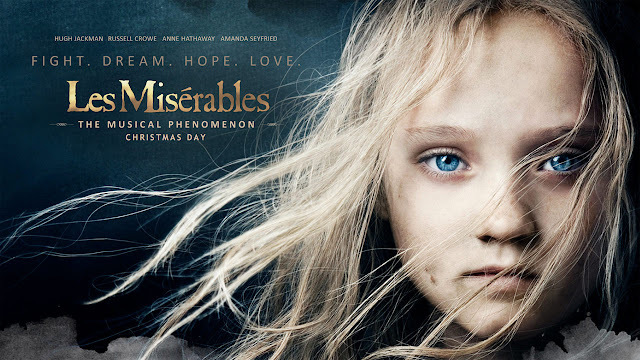 So, without further ado - here is Emma with her review of 2012's Les Miserables! I am primarily a book blogger, and in no way a film critic, but when the two worlds collide I enter the arena with an open mind. Granted, films rarely amount to, and even more rarely surpass, their literary counterparts in my experience, but Les Miserables is something of an anomaly. It has been retold successfully and adored in many forms. It seems to be universally loved as a story and also an inspiration to many - including one of my favourite authors, Carlos Ruiz Zafon, who uses the book as a plot device in The Shadow Of The Wind; a book I recommend heartily to anyone. I have read Victor Hugo's masterpiece, and loved every minute of it. I have equally enjoyed the London West End show on more than one occasion, having been lucky enough to witness the faultless Norm Lewis as Javert, and Alfie Boe in his rise to fame. Now, cinema goers have a fully realised film, created with all the lavishness modern technology and CGI allows. At almost 3 hours long, the film packs in all the songs from the stage alongside the added bonus of brilliant scenery, bringing a depth to the vision of Hugo's 19th century France that the stage cannot. We are also treated to a host of well cast actors. On the face of things Hugh Jackman and Russell Crowe are the perfect choices for Valjean and Javert, with their imposing build and rough, tough appearances, and Anne Hathaway embodies the fragile Fontaine beautifully. Visually, the film is stunning. I actually wish I could have seen it on an even bigger screen so that it could fill my sight entirely. It was just beautiful to look at. I loved the use of long shots and closeups while characters were singing, and especially the decision to have the characters singing straight into the camera lens, breaking the "forth wall". I felt this was a brave thing to do, and disconnected the songs from the rest of the film almost. However, I have a feeling it is a "Marmite" thing. I thought it was particularly well used during "I dreamed a dream" - a song I have heard so often post-Sue-Bo that I felt I would never be able to connect to it ever again. How wrong was I?! Tears rolled down my face as Anne Hathaway broke apart in front of me, and I could not take my eyes away from her. Onto my next moan then... let's talk about instalove. The dreaded instalove, of the kind favoured by authors of young adult novels with aspirations of Twilight. We find that young people just need a smile from afar to fall hopelessly, heedlessly in absolute I'll-die-without-them LOVE. And here within lies the roles of Marius and Cossette, two of the drippiest, most inconsequential, infuriating characters ever to grace your eyeballs. (The book portrays them a bit better, but this film had me choking on my popcorn). One day, Marius sees a girl smile at him and announces he is in love. If he doesn't find out who she is he might just stop being, goldarnit! Someone find out where she lives!!! Blah blah blah they falsetto at each other in the longest gazing sequence you will ever encounter. Romeo and Juliet "seeing her through the crowd" genius this is not. I believe the biggest fault in this film was in the apparent process of "putting the stage on the screen, with added book". It seems that the film has forgotten it is cinema in all respects other than in technology enhanced visuals. And yes, it looks good, but when characters are singing little twiddley sentences (which are not songs and never amount to songs) instead of scripted prose, to tell us where they're going or what they're seeing, the film feels its length. I also think this film would have been all the better if there were no songs at all - call me blasphemous if you will! While some cast members do a notable job at telling the story of their lyrics, there is a distinct lack of emotion in some of the weightier numbers. The confrontation lacks urgency, Javert's final song makes his act feel like an overreaction due to a lack of madness and obsession in his delivery and "bring him home" seems like a foolish leap of faith. So. While I didn't dislike Les Miserables, I didn't exactly hold it in, say, the ranks of Chicago and Phantom of the Opera, both of which were film versions of musicals that brought something new and different to their base material. I also don't think I would recommend Les Mis to anyone who has a vague uncertainty about musicals. The sentences-in-song thing just won't endear them to the concept. I do, however, recommend the black and white subtitled version of Les Miserables if any fan of the story wants a cinematic representation. Grittier, dark and with no musical content the story is beautifully told. Go vintage on this one guys, and see the London musical. It's epic. Many thanks to Emma for the excellent review. If you'd like to read more of Emma - please take a visit over to http://www.mabismab.com you won't regret it! I was also annoyed by the instalove between Cossette and Marius. But movies do run on a time limit. I don't like Amanda Seyfried so I thought Cossette was a bit annoying. Gavroche is my favorite, he is so cute. Overall, I thought the movie was pretty well-made. Oh my, yes he is so cute. But I found it so random that he had an Oliver Twist 'allo gov'na' accent! It was so out of the blue :D haha!